Everyone believes that Brazilian players are naturally skillful and just learn the game on the street. Nothing could be further from the truth. Some of the reasons that Brazil exports close to 1,000 players to foreign leagues every year is a combination of huge population, intense scouting, and hours of technical training. I stayed at the training ground of Atletico Paranaense while doing my NSCAA Premier Diploma. Atletico sells on average three players a year abroad and they attribute that to their extremely scientific approach to player development. They have four staff members that have PhD’s in bio mechanics (from US universities) that are constantly doing research to refine their player development model. 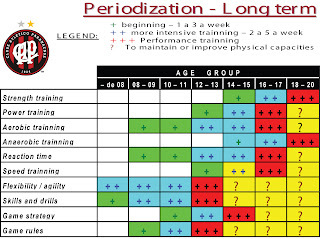 What made me think about this chart is the number of coaches every day that I see working on aerobic and anaerobic conditioning at such a young age. For example, they don’t focus on anaerobic training until age 14. Aerobic training is only focused on once a week in a five day a week training regiment. Click chart for larger view.